The Amiga interest have risen a lot since the launch of the Vampire FPGA cards last year. Now you can finally get them at Amiga stores worldwide like on Amedia Computer in France. They came and they have managed to revolutionize many classic Amigas worldwide. With them your Amiga 500 or Amiga 600 have power that is only seen in 68060 Amigas and it is way faster also. However, on the other page of the Amigaworld in 2017, you have A-EON with Trevor Dickinson as CEO. 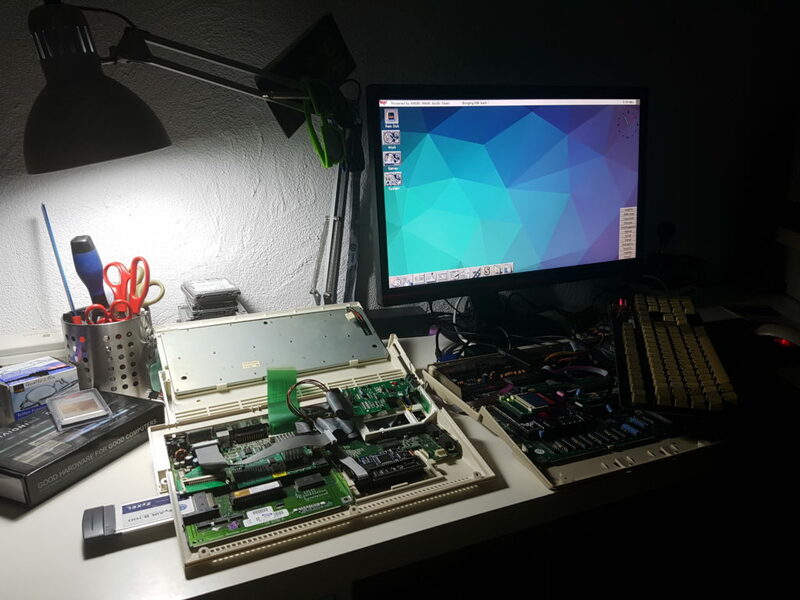 This company is helping and pushing the nextgen Amiga Hardware with AmigaOS 4.1 (and MorphOS support to some extend) as much as they can. Amiga Nextgen is great, but it does lack the real Nostalgia feeling. So!.. Vampire FPGA is fixing it a lot. But what should you choose? When choosing between the superpowers in nextgen Amiga hardware and the mighty Vampire FPGA for the classic Amiga machines. The very first thing that you should decide is if you need enough powers for heavy web browsing and HD movie watching or getting Nostalgia with some Power that extends a classic Amiga life a lot. 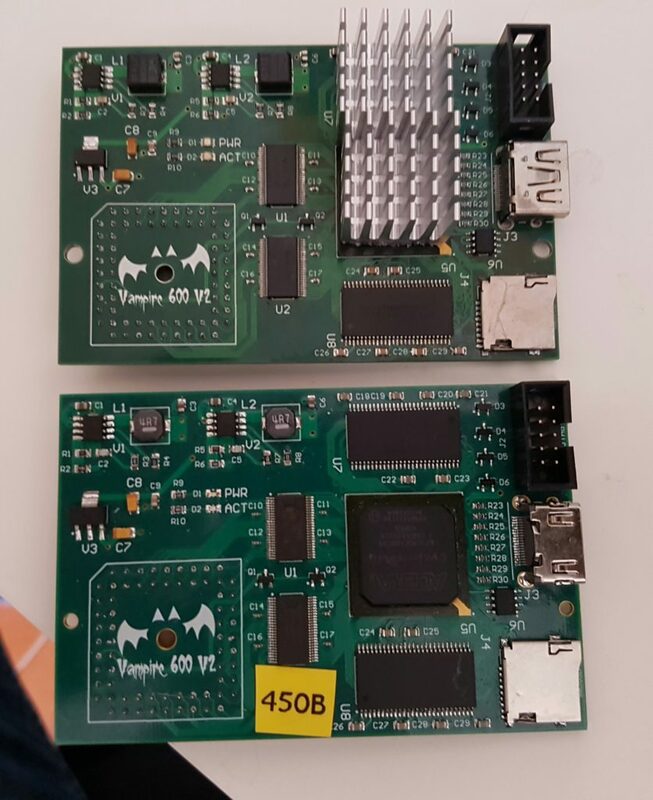 At the moment the Vampire FPGA cards are pretty awesome when comparing them to the original Amiga hardware that it is replacing. However, you won’t be able to use your Vampirized Amiga for full CSS browsing, checking YouTube or even work with WordPress sites. 128MB of RAM is just too little and a good CSS browser is still lacking for AmigaOS 3.x. There are info about that the Amiga 1200 version will have 1GB of RAM that will come with it. Then CSS browsing will help a lot for sure! However, if you choose to go for one of the Nextgen Amigas then you have access to OWB, which you find for AmigaOS 4.x, MorphOS and AROS. This webkit web browser let’s you do much more “modern” kind of things. Especially on PowerPC or x86 systems with several gigabyte of RAM. But if you want to get the same compatibility as on any Linux, Windows or MacOSX computer. Then I wouldn’t recommend AmigaOS for Internet at all. But if you can live with the limitations that AmigaOS does have. Then the nextgen Amiga is recommended to have. If you choose to go for a Nextgen Amiga, then I would recommend to have one with 1GB of RAM or more. A Vampire FPGA will simply not be able to load Facebook at this point, which is a popular social media website on-line. That website on its own, takes between 400 and 600 megabyte of RAM! The other rival by Google takes between 300 and 500 megabyte of RAM. However, Twitter works fine on Amigas from 68030 and up. Download AmiTwitter from Aminet as it is an excellent Twitter app for almost any AmigaOS specifications. On our Efika PowerPC computer, which is compatible with MorphOS. This small mini PowerPC motherboard also got only 128MB of RAM. When visiting Facebook, I always ended with guru. So, if you want AmigaOS feeling on the web with most of its functions working, then forget Vampire FPGA. But if you can handle to surf on simple CSS sites and HTML made website. Then this product is perfectly fine. With the Vampire FPGA card you do get a graphics card! The websites will be show with nicely 24bit pictures. The Apollo Team, which is behind Vampire is now focusing on their development on getting all original Amiga graphic signals and music out thru the HDMI connector. Because now people have to connect two monitors, but on one of the latest YouTube videos by Simo Koivukoski, where he shows how far they have come in the development. Here he shows that Slam Tilt AGA runs with both Audio and Video going thru it’s HDMI connector. Everyone is waiting for the GOLD3 public release for sure! So, it’s not long until everyone can just have one monitor connected to their Amigas with Vampire FPGA inserted. Now, when they have finished the Amiga signals thru HDMI development. Then the Vampire will for sure become the ultimate accelerator card for Amiga with strong 68060 alike power” However, if you want more power. Most of all Amiga Nextgen PowerPC and x86 machines does have full support for HDMI from the start. So if you think about your wallet. Then if you just want to have AmigaOS connected to your monitor, its cheaper to get a secondhand PowerMac G4, PowerMac G5 or PowerBook G4 with MorphOS on it. The A-EON products have put their prices on their AmigaOne products very high, but with the launch of A1222 Tabor motherboard getting closer. When it is released! To buy a nextgen Amiga won’t be too expensive. Also! If you do want to try AmigaOS on your x86 PC or Mac. Then I recommend you to just download the latest Icaros Desktop. You can install this open source AmigaOS as a standalone operating system or you just use a VM (Virtual Machine) program like VirtualBox from Oracle to test it on your Windows or MacOSX machine. The Vampire FPGA is still heavily under development. But in the end it will be a very nice and solid product. For now, it does require you to buy a classic Amiga that it supports. Later these people also plans to release a standalone Vampire Amiga of some sort. Now, that will be interesting. But if you have got yourself an classic Amiga. 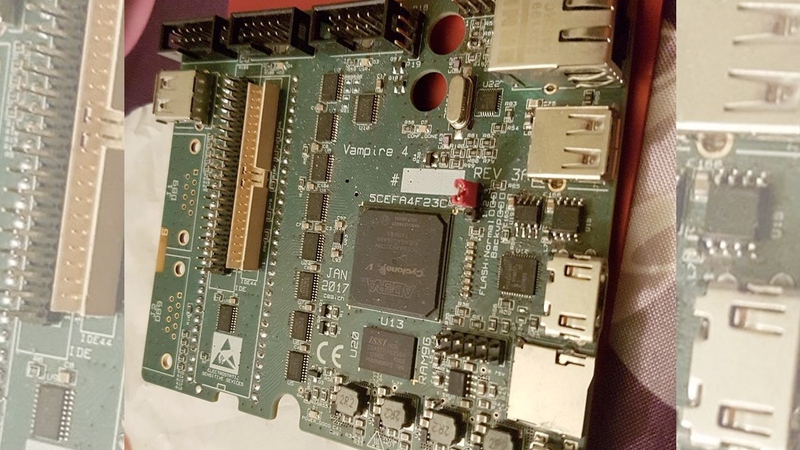 Vampire FPGA will give you the right nostalgia feeling all the way. There are so many excellent AGA games that now works on the older ECS and even OCS Amigas. The full and right answer to this is really about What Are You Going To Use AmigaOS For? Because! You really need to think of what you really need. 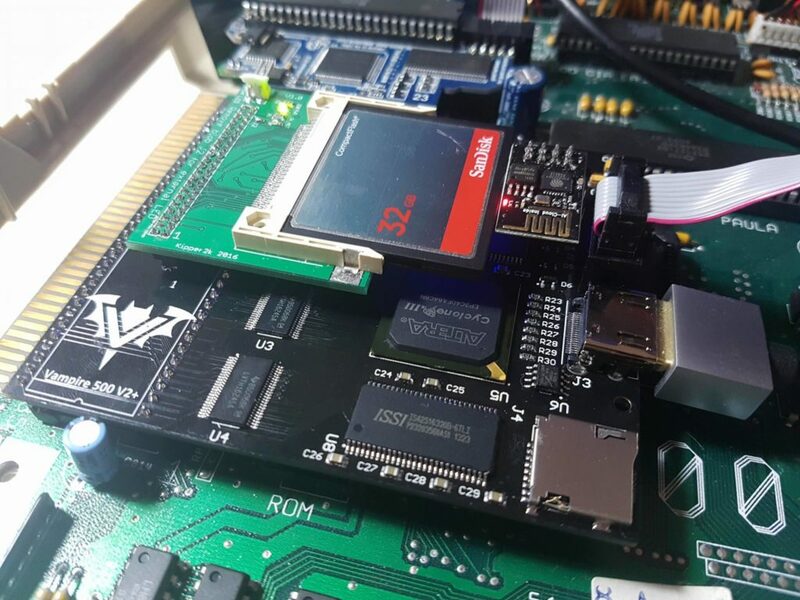 If it is classic Amiga feeling with power, then you should go for Vampire FPGA! Because then you are fully connected to use the original Commodore Amiga tank mouse or a fabulous joystick also. You will hear the brilliant notes of Paula sound and also be able to play AGA FPS games at rocket speeds. There is also MAME, a port of an enhanced version of OutRun and much more done for Vamparized Amigas! So, the development is really going on. But if you don’t need full nostalgia support, then AmigaOS 4.x, MorphOS and AROS is really great choices. Many Amigans have both nextgen Amigas, original Amigas and Vampirized Amigas. AmigaOS is sort of compatible thru all of the different variations. For Vampire, there is also already made a Ready made AOS3.9+ distro for Vampire accelerators which is called ApolloOS. You can read more about it on apolloos.weebly.com website! So, we can sort of conclude that it is all about Cost VS Need. Amiga is so much about it’s software and hardware. So, as you see. Amiga platform does have a lot to offer.